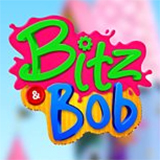 Bitz & Bob is a TV show on British national television from CBeeBies with an average rating of 3.3 stars by TelevisionCatchUp.co.uk's visitors. We have 86 episodes of Bitz & Bob in our archive. The first episode of Bitz & Bob was broadcast in April, 2019. Did you miss an episode of Bitz & Bob but don't you wan't that to happen in the future? Please set an alarm and add Bitz & Bob to your favourites, so we can remind you by email when there's a new episode available to watch. For free! Animated preschool series. Bitz needs to send two stranded aliens back to space in time for their granny's birthday. Animated preschool series. It's the Snowy Goat Gala, but all Little Bo Purl's goats have caught colds and are sneezing. Animated preschool series. Bitz has to unfreeze Bob, Bevel and Purl and get a tiara back from two castle trolls who have stolen it. Animated preschool series. It's Snowy Sports Day, but Bitz and the gang are struggling to keep track of the scores. Animated preschool series. Bitz needs to work out how they can pull Bevel from the snow without sinking themselves. August 28, 2018 of the TV-show Bitz & Bob was broadcast by CBeeBies on Sunday 6 January 2019 at 15:05. March 13, 2018 of the TV-show Bitz & Bob was broadcast by CBeeBies on Sunday 6 January 2019 at 8:20. August 14, 2018 of the TV-show Bitz & Bob was broadcast by CBeeBies on Sunday 2 December 2018 at 15:00. Andy's Safari AdventuresCatch Up on Andy's Safari Adventures and watch online. Missed an episode of Andy's Safari Adventures, broadcast by CBeeBies? We give you an overview of all the latest episodes, so you can pick and watch your favourite episode.